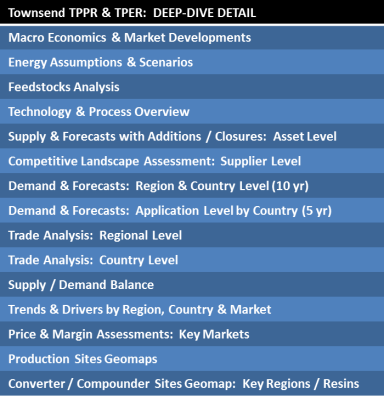 Published annually since 1996, the Townsend PE & PP reports provide massive amounts of granular detail on supply & demand and the most comprehensive outlook available. We publish an array of comprehensive & data-intensive polyolefin reports. From grade level pricing to long-term forecasts, all are deep-dive & leverage granular detail.